Almond milk is a dairy-free milk substitute that you can store in much the same manner as cow's milk. It has a creamy texture and a mild nutty flavor. Storage times for opened packages of almond milk depend on the type of almond milk and whether it's stored properly. Check the dates on the packages before purchase to ensure the longest storage life possible. The type of almond milk affects how long it will keep. Commercially produced almond milk has a “use by” or “best before” date stamped on the carton. It's good practice to use the milk by the date listed on the container to ensure the best quality, but the milk may stay safe to drink for several days past this date. Homemade almond milk generally has a shorter shelf life than commercially produced milk, so you must use it more quickly. Commercially produced almond milk comes in refrigerated or shelf-stable varieties. Both varieties require refrigeration after you open the carton. Leave the almond milk in its original packaging but close the carton after each use. Store homemade almond milk in a sealed container, such as a glass jar or a pitcher with a lid. Keep the almond milk in the center of the refrigerator, where the temperature remains the most constant. Commercially produced almond milk stores well in the refrigerator for about seven days after opening, if it is kept properly packaged and refrigerated. Shelf-stable varieties typically last for seven to 10 days after opening when kept refrigerated. This storage time may extend beyond the “best before” date on the package so spoilage isn't usually an issue, although the flavor quality may decline. Homemade almond milk should be used within two days of making it. 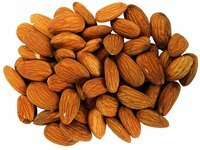 Your eyes and nose provide the best guide for determining spoilage of almond milk. If the milk develops an off odor or flavor, discard it and open a new carton. Almond milk often develops a sour odor or flavor, similar to cow's milk, when it spoils. The carton may also become bloated as the milk spoils. Curdled milk, lumps or a slimy texture also indicate spoilage. Visible mold growth is also a telltale sign of spoiled milk.